If you are like me and love digital photography and doing most anything on your computer this blog post is for you! Digital Scrapbooking at it's best! um...M.E. I don't really like scrapbooking. That's okay this program is so, so much more! I used it for so many applications. Scrapbooks yes, but journals, tags, cards, boxes, labels, multimedia videos, print your own customer designer series paper...I can go on! For 30 days you can try a full trial download for FREE. This is an ongoing program so you can download it anytime and as soon as you activate it your 30 days begin! Once your trial is over you can order either order the downloadable version or the disc to continue using it. I recommend the Sweet Details Photobook. Add Pictures to the already beautiful template and Print in our professional print services. You will receive a beautiful book at your doorstep to share with your family and friends. Don't need to know more just want it now!! My Digital Studio~ Fun designing my blog banner! I am having so much FUN with MY Digital Studio. A premier digital crafting program. This program will be available for purchase from me on October 1st. You might think why do I need this when I have a huge stash of paper in my craft area? This will fill a void that paper just can't! Consider My Digital Studio a design tool similar too, but better than, some of those photo programs you might already have on your computer. 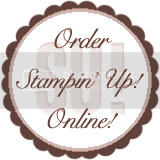 What makes it a must have for me and I think it will for you too is that it's ALL Stampin' Up! but yet not limited to. I can add other images but really I get the best of Stampin' Up! but in a digital format.